Now, this was a show I was looking forward to. I had my ticket bought long ago for the show in Madrid, but unfortunately I couldn't get my camera with me nor arrange any interview with the bands, prior or after the show, thus, after seeing the gig in Madrid I made up my mind to travel to Vitoria (340 km north of Madrid), the capital of the Basque Country, to catch them again on their following Spanish gig (in the meanwhile they played two shows in Portugal). I managed to get access to Within Temptation prior to the show and made an interview with them [see elsewere on this site] and also, I was allowed to take pictures of the whole show. I would like to thank the staff of Azkena Gasteiz, specially Eneko and Alfonso for their help and cooperation, without them this review wouldn't have been possible. Eskerrik asko! Thanks also to the Within Temptation guys and girl for being so kind as to agree to do an interview and bear with me for a while, Specially Robert, Sharon and Veroniek (band's hairdresser and wardrobe assistant and also merchandising girl). Bedankt! 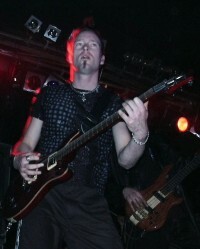 This American band already opened for Paradise Lost on their US tour and the UK goth metallers liked them so much they decided to take the band to their European tour as well. 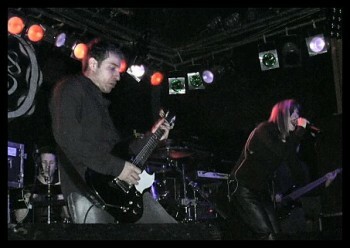 TTV practice a, so to say, electronic based rock with slightly dark influences. Their female singer has a voice that reminds me at times of Bjork. All in all an interesting band to kick off the shows and to put the audience in the mood for what is yet to come. Now, I was really looking forward to see them live. I discovered them two years ago, after I got their second album, Mother Earth, which has been recently re-released with four bonus tracks, in order to make it available in many countries where it was never released back in the day. Just one month ago I got their DVD where I could see their live show and got really impressed, so as I said, I was looking forward to see them. For those of you who don't know this Dutch band, let me tell you they started out as a Gothic Metal band with doom touches, clearly seen on their first record, Enter. 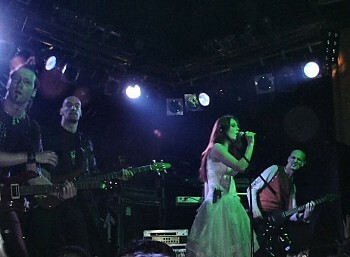 Later, on their second effort, Mother Earth, they changed quite a bit the style, and, even though keeping the metal base, got more etherial, with lots of melodies and catchy keyboard lines, not to mention the angelical voice of Sharon den Adel, who has become the only vocalist of the band. On their previous album she was also joined on the vocals by band's guitarrist Robert Vesterholt who sang in gutural tones, [sorry Robert, but I don't miss your grunts too much :-P]. As for the show, it was really good to see that on the Madrid gig, there was quite a lot of people who were there to see WT instead of PL. As the lights went down and the sampled intro started playing, the crowd went nuts, and as soon as the band appeared and started playing, the audience got in crescendo mood that lead them into an apotheosis when Sharon climbed up the stage and started singing Deceiver Of Fools. 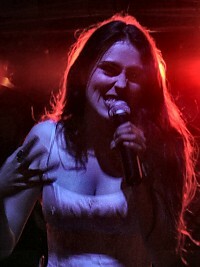 Sure the band play really solid, with Robert Westerholt and Buud Jolie on guitars, Jeroen van Veen on bass, Stephen van Haestregt on drums and Martijn Spierenburg on keyboards, but it's obviously Sharon den Adel's voice, stage presence, and, why deny it, gorgeus look, that makes their show so special. Not only she sings beautifully with such a sweet, yet powerful voice (she nails all the notes on the songs just like on the album), but she's also charismatic, filling all the stage and transmitting it to the audience who fell surrendered to her. After the storming beginning with Deceiver Of Fools, Robert, who happens to speak a basic, yet decent Spanish introduced the band and thanked the people for their very warm welcome. Then, the keyboard driven intro of Caged lead the audience into another excellent performance full of passion and energy. The crowd noticed it and gave absolutely everything, to the surprise of the band who didn't expect such a great reaction from the fans. Right after that, they played a new, yet untitled song from their upcoming album that is planned for recording this summer. It sounded really well, I was expecting some in the same mood of the lattest album, or even more laid back, but it turned out to be quite a wild tune and the crowd enjoyed it a lot. Mother Earth followed with Sharon trademark dances and by then the atmosphere got really hot (think what you want of my words!). ;-) After that, the band got into a great Kate Bush cover Running Up That Hill, which will be WT's next single (to be released April 17 in The Netherlands and Germany, me thinks) and will also be included on the band's forthcoming album. They managed to keep the 80's poppy feeling yet giving the song their own approach that made it truly enjoyable. The Promise and a fave of mine, Ice Queen where the final songs of the show, too short for the fans but undoubtely very intense. Both the crowd and the band really enjoyed a lot the set, and one last remark has to be made on the sound that was excellent for a guest band. 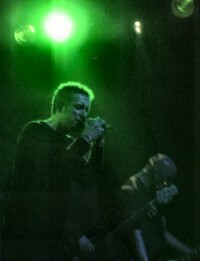 In fact, as you will read later on, in Madrid they got much better sound than Paradise Lost. I have to say that, being both shows in Madrid and Vitoria quite similar in terms of the band's performance, it seemed to me that fans in Madrid knew the band better than those in Vitoria, thus giving more feeling to the show, although after their show, Basque fans were increased by numbers. Well done guys (and girl)! 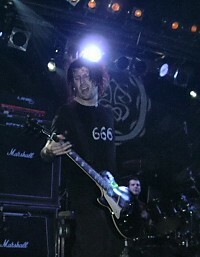 First of all I will tell you I will make a combined review of both shows (Madrid and Vitoria) by Paradise Lost. The reason for it is simple, they were absolutely different shows, not because of the setlist (just one more song in Vitoria), but both on the sound and on the band's performance. Thus I'll talk about both shows to point out the similar and the opposite issues. It was my first Paradise Lost gig, and being a fan since five years ago or so, and after listening to their lattest album, Symbol Of Life, (that settled a return to their more gothic rockier sound, after their previous techno adventures), I was expecting a storming show, as far as music is concerned, since having seen quite a few live video recordings of the band's shows in the past I was aware they are not precisely "passionate" on their live performances. But their coldness exceeded my worse expectations. 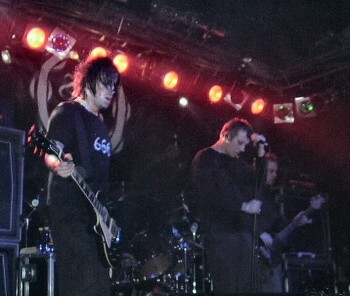 From the opening Isolate (from their lattest album), it was clear the band was not on their finest night. The sound wasn't good at all. Sure the band needs a different mix than Within Temptation, since PL music is more aggresive, louder and more metal oriented, (though with a lot of electronic touches lately), but the sound engineer didn't get it well balance at any time during the show. The bass was way too loud all along the set, shadowing Nick Holmes vocals and also the pre- recorded (sampled) keyboard and backing vocals. This was particularly evident during Erased (Symbol Of Life's new single), which female backing vocals would have been unaudible if it wasn't for the crowd who sang them along. The band overlooked most of their stuff from first albums, playing just Enchantment from their classic Draconian Times album, the unavoidable As I Die, and they focused logically on their lattest album, with some songs from One Second, Believe In Nothing and Host albums. Separate consideration deserves the awesome cover of Bronski Beat's Small Town Boy, it rocked big time! As I said, Nick Holmes was quite cold, not in the mood at all, avoided looking at the crowd, saying a lachonic thank you after the songs and just a few words to introduce the next song (if anything)... really lacked of communication with the audience. This, with such a passionate audience as the Spanish one, can be particularly serious. Don't get me wrong, in musical terms, putting aside the bad sound, it wasn't a bad show at all, (even though it was really short, just 75 mins), the rest of the band played with energy and specially guitarists Greg Mackintosh and Aaron Aedy were particularly good, and the crowd gave a good response, even though it could have been much better if only Holmes would have been a bit more up to it. Three days later, I was hoping for the best but prepared for the worse. I really wanted to give the band another chance. And they didn't let me down this time. The band was on a much better mood, Holmes was more talkative, moderately happy... Let's face it, he's not a cheerful guy, he probably wouldn't apply for a joke contest, but he definitely was much better than in Madrid, [perhaps it was because of the Rioja wine? ;-)], and so was the sound, loud, but much clearer with a balanced mix, and the samplers at a right level. The audience really enjoyed the, again, short show. Sure there were a lot of much loved classics missing, but all in all a good, rocking performance. 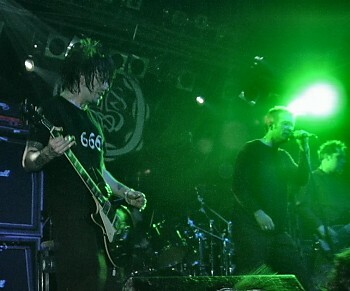 This time they also played Draconian Times hit The Last Time, much to the joy of the devoted fans. As for me, I would have preferred Forever Failure, or Pray Nightfall from their latest album, but as we say over here, it never rains for all's good.